The tombstone phenomenon is a defect that occurs when passive SMT components are partially or completely lifted from the PCB pad. What usually occurs is that one end of chip is soldered on the PCB pad while opposite end of the chip stand ups vertically, looking similar to a tombstone in a cemetery. ▪　The components’ terminals are not covered by more than 50% of PCB pads due to the space between the two pads is too wide. ▪　The two pads are designed with different sizes. ▪　The solder paste printing is uneven. ▪　The component placement is inaccurate. ▪　The reflow oven temperature is uneven. 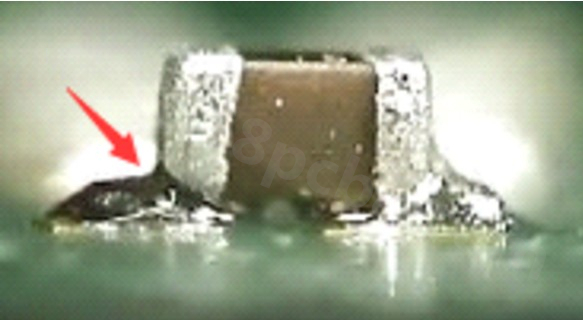 ▪　The thermal conductivity of the PCB material has different heating capacities. ▪　The presence of nitrogen has a tendency to increase the occurrence of the tombstone defect. ▪　Placing the chip parallel with the reflow oven’s conveyor. ▪　Design the pad sizes according to the recommendation specified on the datasheet. ▪　Reflow profile -- for lead-free solder paste, use a gradual soak ramp rate before reaching the melting point. ▪　Improve the accuracy of the solder paste printing. ▪　Impove the accuracy of chip placement by decreasing the placement speed. ▪　Esnure the pick and place nozzles have been adjusted to the correct pressure. Another phenomenon is the OPEN circuit defect. This occurs when there is an electrical continuity OPEN circuit between at least one terminal of the chip and the solder pad. This phenomenon is very critical because even AOI cannot detect this failure most of the time. ▪　Component oxidization has occurred. ▪　The pad sizes are not correct. The component’s terminals are not covered by more than 50% of PCB pads due to the space between the two pads is too wide. ▪　There is poor flux activity. ▪　Adjust the pressure for pick and place nozzles. Next：How to Request a PCB Assembly Quote in China?